You know golden milk, right? Well, have you met her cousin golden hummus? She’s sort of a diva. She goes by goddess because she’s so vibrant in color and boasts mad anti-inflammatory effects. Give her a crown already (or at least a carrot). Also, you should totally invite her over because she might just change your life. Golden goddess hummus? Yes, it’s a thing. When your food has fiber, protein, plant power, and tons of anti-inflammatory perks, you can call it a goddess. I checked (sorta). 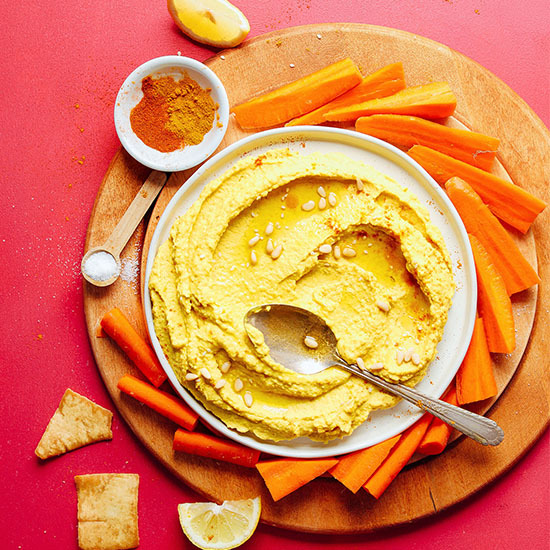 This 9-ingredient, 10-minute hummus gets its gorgeous golden hue from digestion-promoting fresh ginger, a pinch of metabolism-boosting cayenne pepper, and a generous sprinkle of both fresh and ground turmeric – the ultimate beauty spice. A little lemon adds brightness, tahini adds creaminess, and salt amplifies the flavor of this dreamy hummus. Trust me, this is your new go-to dip. This would make the perfect side or snack when you’re in a hurry but need something satisfying and nutritious. It’s so tasty with fresh vegetables, flatbread, pita chips, or even vegan naan! It would also be a delicious sandwich spread for things like my Vegan BLT or Chickpea Sunflower Sandwich. If you try this recipe, let us know by leaving a comment, rating it, or tagging a photo #minimalistbaker on Instagram! We’d love to see what you come up with. Cheers, friends! 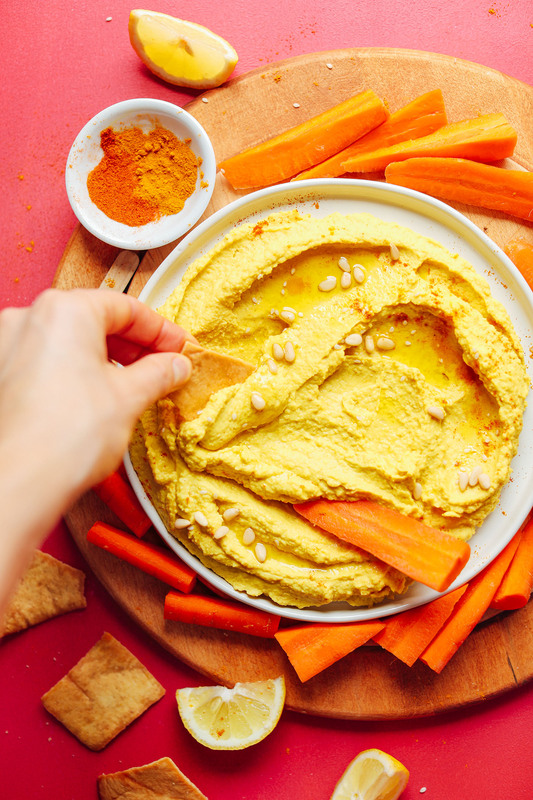 10-minute golden hummus infused with anti-inflammatory spices like ginger and turmeric! Creamy, flavorful, and protein-packed! 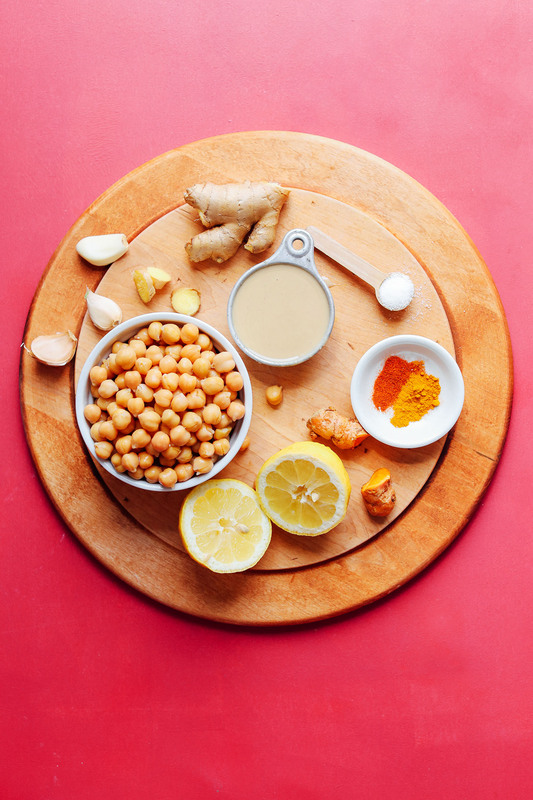 Add drained chickpeas, lemon juice, tahini, garlic, ginger, fresh turmeric, ground turmeric, salt, and cayenne (optional) to a blender or food processor and blend on high until creamy and smooth, scraping down sides needed. To create a creamier texture, add a bit of oil and/or (if avoiding oil) water. (I used 1 Tbsp oil and 2 Tbsp water). Taste and adjust flavor as needed, adding more garlic or ginger for spice/zing, lemon juice for acidity, salt for saltiness, grated turmeric for earthiness, or cayenne for spice. I added a bit more ground turmeric, lemon juice, and salt. Serve as is or garnish with pine nuts, sesame seeds, or more spices. Parsley would also be a nice addition. Store leftovers covered in the refrigerator up to 3-4 days. *You can save your chickpea brine for all kinds of things - check out our Aquafaba Guide for recipes and instructions! *If you don't have fresh turmeric, sub ground (slightly les,s as dried can be more pungent). *Nutrition information is a rough estimate calculated with lesser amount of oil. *Recipe makes ~1 cup hummus. Since I am following the dietary recommendations and advice of Dr. Gundry from Loma Linda, I don’t use chickpeas, peas or beans anymore; do you have any ideas for alternatives to beans? Maybe walnuts? Or…? Please let me know as I have been making hummus for decades using the personal recipe given to me by my friend Ference Schontal. Hmm I’m not sure walnuts would work. If you experiment with this recipe, let us know how it goes! I added cumin too and it was really yummy. Great recipe! Thank you! Glad you enjoyed it, Stephanie! Cumin is a great addition. Great hummus! So many interesting flavors in it. Thanks! This is perfect! I put it on top of your Mediterranean baked sweet potatoes- sooo good! All of your recipes are so great! Thank you! I really want to make this, but I live in the Philippines and do not have access to tahini. Are there any good substitutes for tahini? Hi Sarah! A nut butter should work! Or omit it, honestly. That would be better. Do you have an article on how to make hummus from scratch (instead of using canned chickpeas). This is really amazing! It’s really hard not to eat it all in one sitting. Thank you! Can I freeze them? And do I just thaw at room temperature? Thanks! Hi! 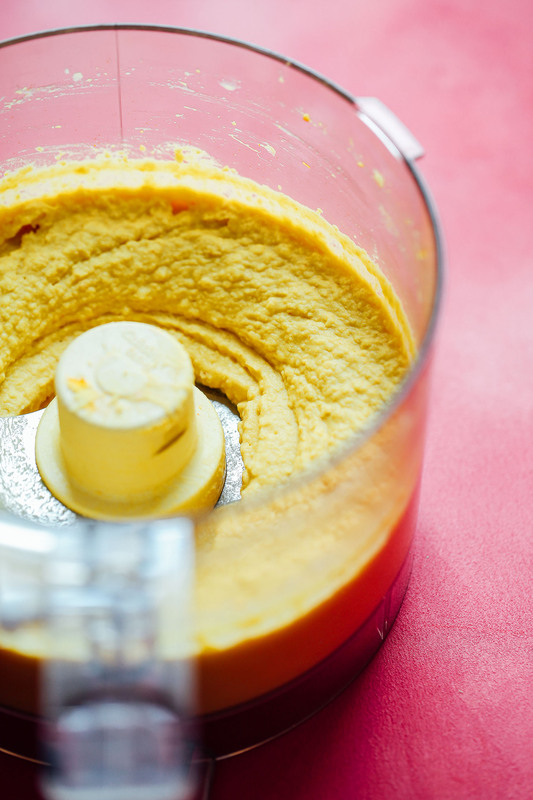 Freeze hummus in an airtight, freezer-safe container. Make sure you don’t fill it all the way to the top because it will expand as it freezes. When you are ready to eat your frozen hummus, simply thaw in the refrigerator the day before you want to use it. When you remove the lid, you may notice some liquid at the top. This is completely normal and the hummus has simply separated. Give it a good stir and it should be ready to eat immediately. This hummus is exceptional…thank you for the recipe! I have a big bag of chickapeas- obviously dry and skinless. Can I use these instead of can? Oh, my! What a delicious spread of yumminess!! I used the pinch of csyenned, water and aquafaba as well as water and really processed it for quite a while. Plus, I cooked my beans longer than usual. I have never found a no oil recipe I liked enough, but this one? Yahoo!!! Thank you! Glad you love it, Deborah! Turmeric is anti-inflammatory and full of antioxidants. I love turmeric milk and add turmeric to all kinds of curries. But today I came across this unique recipe. I will surely give this golden hummus a try. I made this today. I didn’t have fresh ginger or turmeric, so I used 1/4 tsp ground ginger and 1/8 tsp ground turmeric (in addition to the 1/4 tsp ground turmeric listed). It’s very tasty. It’s good on rice crackers. Thanks for the recipe. Any clues as to where to look for fresh tumeric stockists…Loving look of this recipe having already made your jalapeno recipe this is a gt combo. Wonderful. Just made my first batch . I am both a Turmeric and Hummus fanatic but somehow – really, I don’t know how I’ve failed at hummus-making life for so long – I have never thought of combining them together into something like this ↑ I always have a pot of hummus sitting in the fridge for when the afternoon slump hits and I need a snack so, once my current jar has been devoured, it won’t take long, this will be the next on my list! Love it! Delicious! I’m glad I found a recipe using fresh turmeric as well as dried. Thank you! Hmm, I suppose? Wouldn’t be quite the same though. This is the best hummus ever! Love your recipes and your blog! :/ you had to call it “goddess” just ’cause it has turmeric, a spice commonly used in Indian/Thai. Like your blog but disappointed in this. Thanks for the feedback! I take creative license with my recipes but understand it won’t appeal to everyone. I love this!! What do you use (idk if it’s a website, app or what) for calculating the recipe’s nutritional value? Right now, I’m visualizing golden milk and golden hummus fighting for the spotlight! It truly is an intense competition, but I think it really depends on my mood! Since I don’t have a blender, I enjoy golden milk more often, but once I get my hands on my mother’s food processor, that just might change! I had golden milk yesterday! Ah, so good. Hope you get to enjoy both! As an alternative to the oil (or water), you can use the aquafaba to thin the hummus. Its “magical” properties give the hummus a creamy, smooth consistency without the added fat. Ooh, thanks for sharing! Great tip. super simple ingredients for the win! 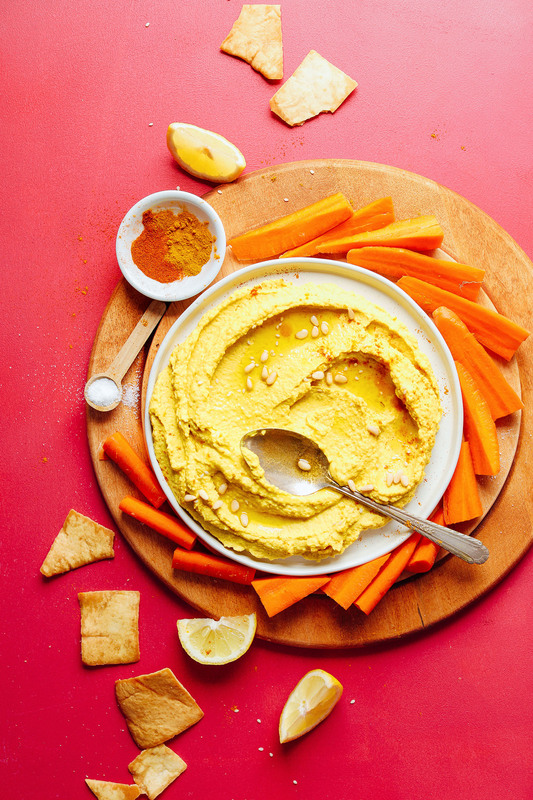 I cook with turmeric all the time but never thought to throw it in hummus, great idea! What could I replace the tahini with, have sesame allergic son, so tahini is a no go in our house. Do you think nut butter work? A nut butter should work! Or omit it, honestly. That would be better. Dana, did you know you were posting this on International Hummus Day? How perfect! Looks delicious! I did not! Thanks for sharing! Finally I can use that jar of tuner if I bought six months ago! This was yummy- I only had a sad half lemon so I was missing some acidity. Also I added a ton more salt (: but I do that to almost all recipes. I’d make this again for sure! HA! Glad you liked it, Heather! Thanks for sharing. Hi Dana, just made this hummus and it super yum! I too didn’t have fresh turmeric on hand so I used organic dry turmeric. Additionally, I added half an onion while grinding in the food processor. Super dip, having with herbed baked potatoes Now? Print friendly version not working for me (on iPhone). Was able to print another recipe today with no problems. Any ideas on this? Thanks! Hmm, maybe try refreshing or using a different browser! I made this to serve with dinner tonight and it was amazing! I used a mixture of liquid from the chickpea can and oil. I also didn’t have any fresh tumeric so I only used dried…but it was still amazing! Just whipped up a batch. Pretty darn good. I think my hummus is better sorry to say but this is an excellent alternative. Thanks for the recipe!! How long does it stay good for refrigerated? Have you tried making it a high powered blender instead of a food processor? It takes it to a whole different level of creaminess?